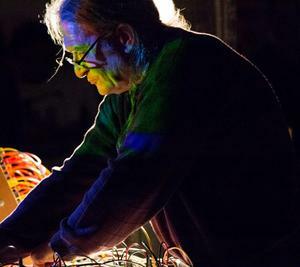 Doug Lynner performs, composes and records using vintage and contemporary analog modular synthesizers, digital and virtual synthesizers and traditional instruments. Of special note is Doug’s Mystery Serge, an amazingly versatile analog modular synthesizer designed by West Coast synthesizer pioneer Serge Tcherepnin. Lynner’s music is based upon the notion of “sound for sound’s sake.” He explores the intrinsic value of sound through mixtures of ambient, avant garde, rhythmic and soundscape genres. Doug received a BFA in Music Composition from the California Institute of the Arts where his mentors were Morton Subotnick, Harold Budd, James Tenney, Leonid Hambro and Nicholas England. There he was deeply immersed in music technology and compositional processes as well as being instructed in world music genres such as south Indian flute, Gamelan Orchestra and Pygmy and Bushmen rhythmic singing and playing.